Hada Benedito Mateo studied Piano, focusing on contemporary music, improvisation and jazz, and developed several projects in these realms. Since 2005 she composes and performs music for documentaries, short films, dance choreographies, cabaret, as well as experimental and free inprovisation music bands. 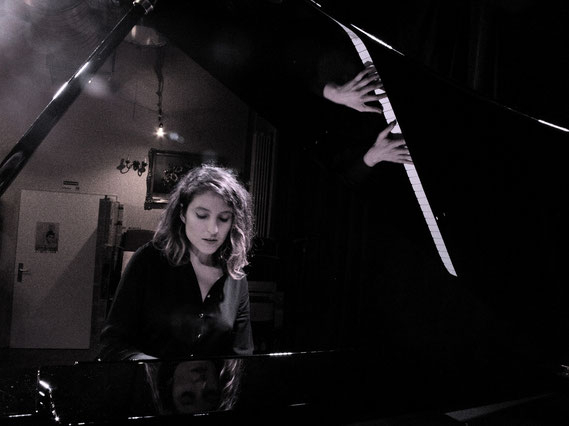 In 2009 she moved to Berlin and started composing and improvising on silent movies live. She has been playing at renowned cinemas as “Babylon” (Berlin) and at “la Cité Universitaire” (París), among may others. Hada´s music and artistic concept has been shaped by direct contact with musicians as Agustí Fernandez, Axel Dörner, Walter Thompson, Tristan Honsinger and Aki Takase. In 2011 she founded the Berlin Soundpainting Orchestra. She had presented her projects in Spain, Germany, France and Japan.